With a couple glasses of champagne, the conclusion to the “Japanese Titled” storyline has been reached. Thanks to everybody who commented or emailed me about this arc – I received more feedback on this one than any other storyline yet, so I’m happy so many of you enjoyed it! First to comment! Love the painful reddish eyes and the one-sided feud. So true to life. thanks, Lor! and what were you doing up so early? Aww, this was kinda sweet. Twisted, but sweet…like Twizzlers. 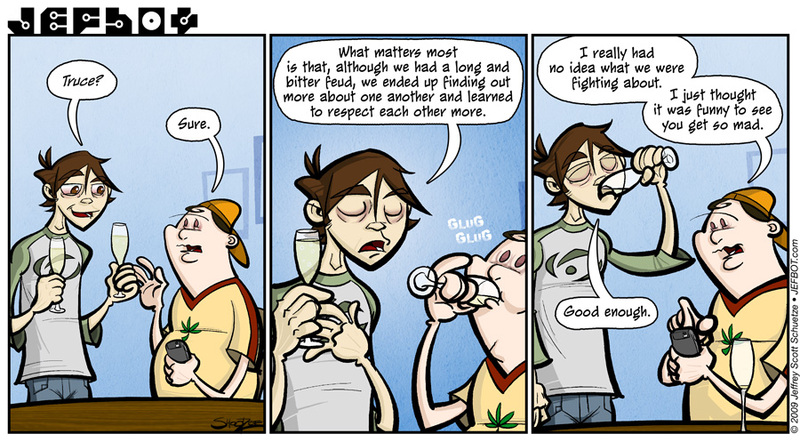 i think “twisted but sweet” is a good description of this webcomic as a whole, Milas. thanks! thanks, argonsassistant! yeah, my arguments with friends seldom get wrapped up in a nice, neat, bow like on a sitcom. this is much more true to how most of them end. Where everyone else feels happy this has come to an end, I hope that much like Satsuma and Choshu clans you are simply biding your time for a more proper dispensation of revenge. How dare he not even remember what the feud was about? A double slap to the face of your honor! I do love jefbto’s face in the second panel. And consdiering the Cornfather’s lucky leaf shirt, I would expect to see his eyes look this way more often. Aww how sweet! (Although I was waiting for the whole “I LOVE YOU MAN!” line to pop in somewhere.) Diggin’ the Iron Giant logo in the header up there, Jeffbot! maybe next time, Spanky! i almost had them do a fist bump, but that’s about as much as the characters are comfortable with, so far. heheh. and glad you like the header. starting to think about what to put up there for february. Yay! They made up…world peace is possible!!! as long as the world doesn’t resort to the chemical warfare we saw in the previous strip, JP! that, he is, John K. that, he is. A hilarious conclusion to a brilliant arc. Well played. Maybe, I dunno. Either way it was a very entertaining arc! thanks, foxmouse – i’m happy you were entertained! and yes, booze does solve everything. at least for a few hours. heheh. i spit on the cornfather and i fart on his pillow! sometimes people don’t know what they have until they fart on it so much that the other person says “ENOUGH”, and then it’s too late to get back what you had. Hey! Where did SUBCULTURE go? subculture’s still around, xinda. but remember: no knitting, no food. I learned that jefbot is dirty & has pink eye and that cornfather has stinkeye! Peace at last! Love the color!!! and what did we learn about xinda? glad you could relate, alecho!